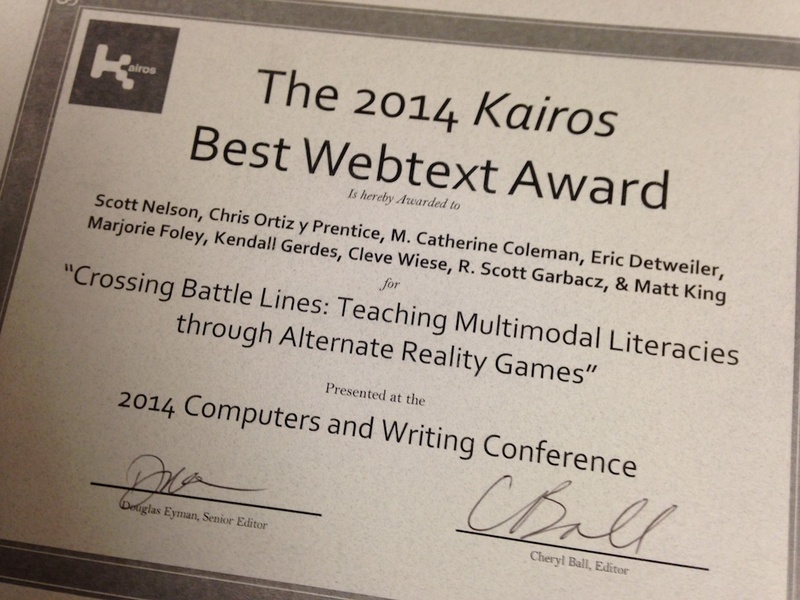 The DWRL celebrates recipients of the 2014 Kairos Best Webtext Award for "Crossing Battle Lines: Teaching Multimodal Literacies through Alternate Reality Games"! Winners include Scott Nelson, Chris Ortiz Y Prentice, M. Catherine Coleman, Eric Detweiler, Marjorie Foley, Kendall Gerdes, Cleve Wiese, R. Scott Garbacz, and Matt King, whose research on designing and having students play an alternate reality game (ARG) in the rhetoric classroom was published in "Crossing Battle Lines." The ARG, Battle Lines, overlaid the modern-day story of a hacker-detective on top of the wild west era dispute between Texas Governor "Pa" Ferguson and university president William Battle. Students investigate the disappearance of the game's guide, a history grad student named Amanda, and in the process undertake on-line and live action rhetorical tasks, learning about and composing with new media tools as they go. "Crossing Battle Lines" shares the game's challenges along with student responses, and the authors reflect on how effectively Battle Lines was used to meet rhetorical learning objectives. The Kairos award was presented at this year's Computers and Writing Conference in Pullman, WA.